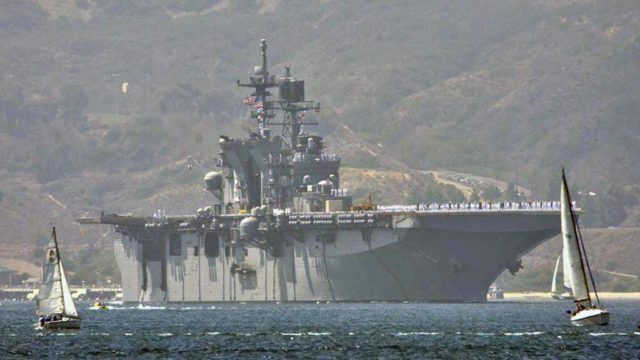 Sailors, Marines and ships of the USS America amphibious ready group will leave Friday for deployment in the Pacific, Middle East and Horn of Africa. The group is composed of the America–the Navy’s newest amphibious assault ship–the amphibious transport dock USS San Diego, amphibious dock landing ship USS Pearl Harbor and embarked troops of the 15th Marine Expeditionary Unit. The Navy said the purpose of the scheduled deployment includes maritime security operations, crisis response, theater security cooperation and forward naval presence. Units of the ready group have spent most of the past six months training and preparing for deployment. “It has been incredible to see the America ARG/15th MEU team come together as a highly capable, lethal, and ready force,” said Capt. Rome Ruiz, commander of the group. The America is the size of a small aircraft carrier and supports helicopters, tiltrotors and vertical-takeoff jets. It’s part of Expeditionary Strike Group 3 and U.S. 3rd Fleet.